The governments of two states Punjab and Haryana, and UT Chandigarh are leaving no stone unturned to prevent any untoward situation in the wake of court verdict on Dera Sacha Sauda (Sirsa) chief, Baba Gurmeet Ram Rahim Singh case. The two states and UT is on “High Alert”. More than 1 lakh ‘Premis’ as his followers call themselves have thronged Panchkula where verdict is to be announced at the District court. ♦ Punjab and Haryana high court pulled up Haryana government for not timely applying the right clauses of section 144. Why was assembly not prohibited, asked the Court? The court said these are basic preventive measures that could have been taken to avoid violence and uncontrollable situation that spooked up a day ahead of the verdict. ♦ Punjab Government has declared a holiday on August 25 for the government offices situated in Chandigarh. 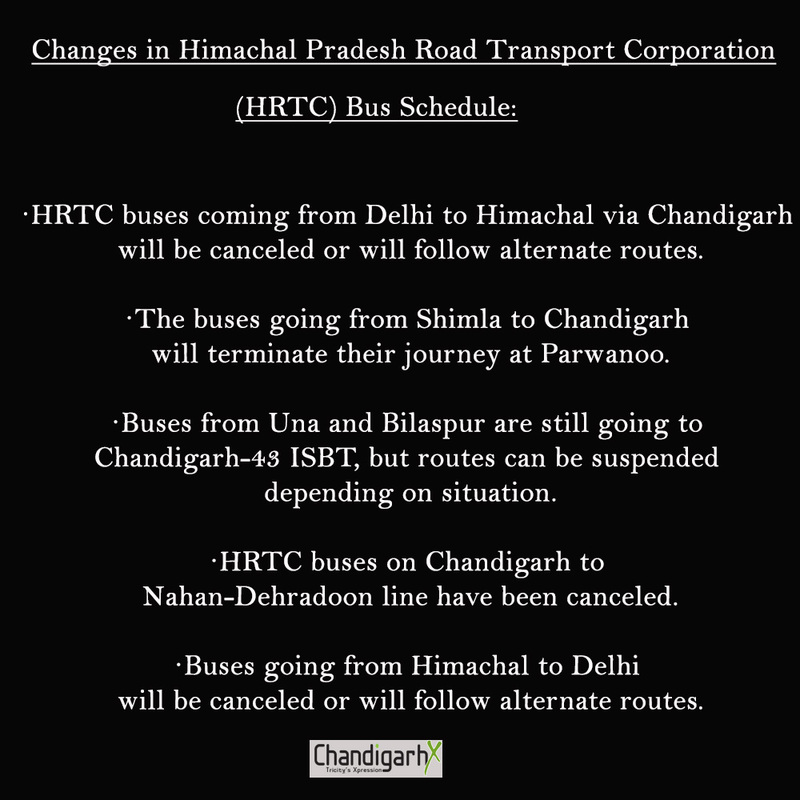 ♦ Himachal Pradesh Road Transport Corporation (HRTC) will also suspend 150 bus routes to neighbouring states from Thursday midnight till Friday. ♦ As many as 150 companies of paramilitary forces with more than 15,ooo personnel has been deployed in the two states to assist Haryana police in maintaining law and order in the state. 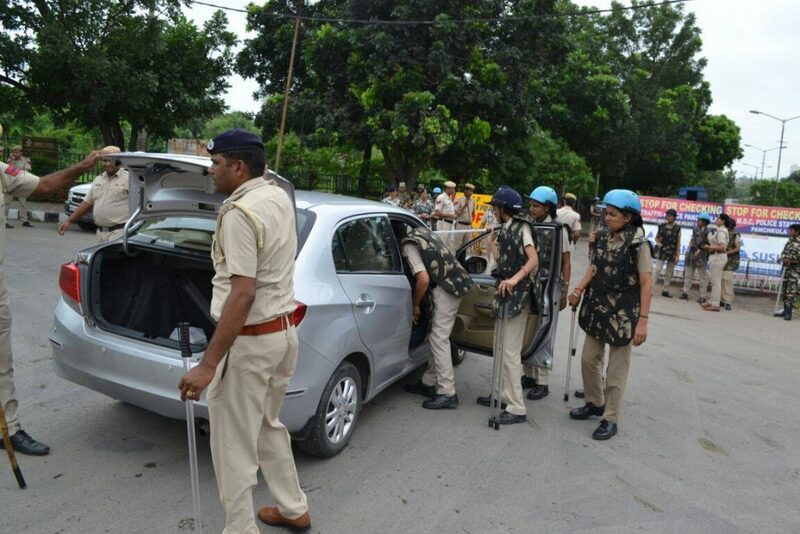 ♦ Over 1.5 lakh followers have gathered in Panchkula creating panic and violence in the state and nearby areas. ♦ Haryana DGP BS Sandhu told Chandigarh Newsline that it had been impossible to prevent the followers from the gathering in Panchkula. The administration has imposed Section 144 CrPC, but, said the DGP, the orders are specific to the movement of weapons only and not on the assembly of people. ♦ The District Megistrate has ordered all government and private educational institutions in Patiala to be closed on 25 & 26 August, 2017. ♦ Mobile internet services to remain suspended in Haryana, Punjab and Chandigarh from Thursday evening for the next 72 hours, said Haryana Home Secretary Ram Niwas. ♦ The court said that it will order army if Centre does not do the needful. The Centre has assured the court that all steps would be taken to ensure law and order. It has also directed the IB to give inputs to state government. ♦ Punjab and Haryana High Court pulled up Haryana government saying they want to avoid the situation that happened during Jat agitation. The court has also directed the Centre to deploy additional forces and take strong steps. ♦ 22 trains have been cancelled ahead of the verdict tomorrow. ♦ Sec 144 of the CrPC has been imposed. More barricades (nakas) have been installed around Panchkula and police checking people vehicles for carrying weapons or any means of violence. ♦ The Haryana transport department has directed Haryana Roadways to terminate all its Chandigarh-bound buses at the Ambala bus stand. On other routes in the state, the buses will ply normally. The buses will be off the roads on August 25, but private buses will not ply for three days. ♦ All government and private schools in Sirsa to stay closed on day of the verdict. ♦ Haryana government has also notified that August 24, 25 would be gazetted holidays in government offices and educational institutions. ♦ Schools and colleges in Panchkula will remain closed on August 24 & 25, while private schools in Panchkula are closed for three days, 23-24-25 August. ♦ Haryana Health Department too has cancelled leave of all its medical and para-medical staff up to August 30. ♦ Haryana health department has reserved 100 beds at the Panchkula civil hospital. Additional staff and doctors in Panchkula civil hospital and 30 ambulances too have been stationed in Panchkula. 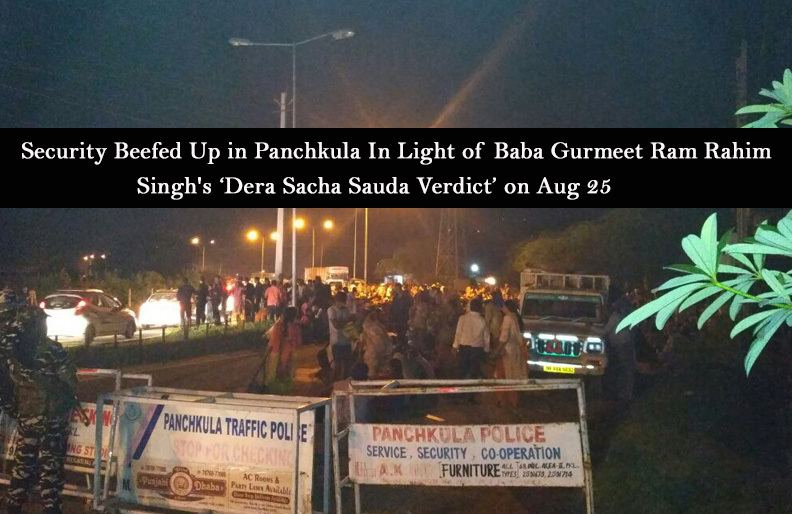 ♦ Security personnel are suspecting that dera followers would be attempting to transport weapons to Panchkula. Police on the Ambala-Chandigarh highway said people they suspected were followers of the sect, were not being allowed to commute towards Chandigarh. ♦ At the railway station, GRP is thoroughly checking all passengers and their luggage. ♦ With speculation rife that Dera Sacha Sauda chief Gurmeet Ram Rahim Singh would be brought to Ambala Central Jail if he is convicted by a special CBI court the police in Ambala have sealed the 1-km area around the prison. ♦ Security has been beefed up at Ambala Cantonment railway station. ♦ Heavy police and paramilitary forces’ deployment near the routes leading to the district court complex in Panchkula. Lawyers have suspended work for three days from Wednesday to avoid inconvenience to the public visiting the courts. ♦ Both Punjab and Haryana have asked the Army to be on standby. ♦ 10 senior IPS officers to be deployed in Panchkula. ♦ Haryana gets eight more companies of security forces. 18 more companies of paramilitary forces arrived in the state taking the total number of companies available to 53. ♦ Haryana government has also requested the Centre to provide 115 companies of paramilitary forces, out of which many have already reached the state. ♦ Duty magistrates have been deployed at all locations in Haryana. ♦ Security forces in Haryana and Punjab have been taking out flag marches at many sensitive places. 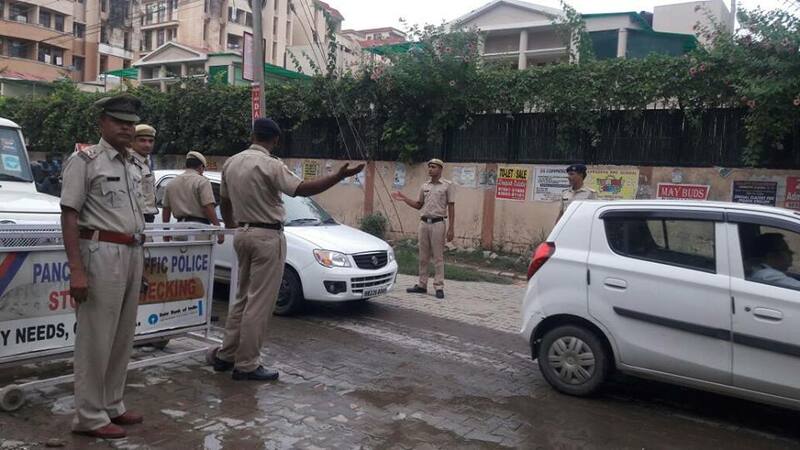 ♦ The state has been put on “high alert” with prohibitory orders being clamped in 10 districts, including Panchkula, Sirsa and those bordering neighbouring Punjab. High level security naka at Peer Muchhala. ♦ Haryana government has also notified temporary prisons in various districts and two drones have been pressed into service in Panchkula to keep an eye on the dera followers camping in the city. ♦ Panchkula police is using drone to monitor the situation. ♦ Roads around District Court, from sector 1, 2, 4, 5 and 6 Panchkula have been cordoned off. ♦ The sale of petrol in bottles or any container from petrol pumps as well as sale of acid has been banned in several districts of Punjab, including Bathinda, Muktsar, Faridkot, Ferozepur, Fazilka and Sangrur, till August 31. 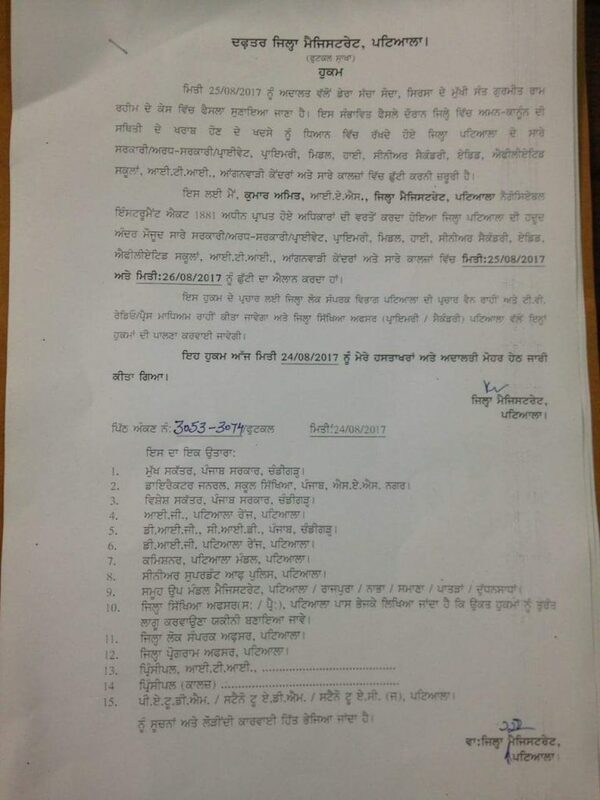 ♦ Mohali deputy commissioner (DC) has assigned magisterial powers to 30 odd administrative officers. ♦ Punjab Civil Services (PCS) officers and gazetted officers having grade pay scale above Rs 5000 posted in Mohali have been assigned with magisterial powers and one officer has been attached with every police station. ♦ Leaves of all the administrative officers, doctors and other supportive staffs have been cancelled till August 25 and the emergency staff at civil hospital has been put on high alert. ♦ Police along with paramilitary forces, the CRPF and Rapid Action Force (RAF), SSB held flag marches at vulnerable places, including Moga, Bathinda, Sangrur, Barnala, Patiala, Ludhiana, Panchkula, Sirsa, Fatehabad, Ambala and Hisar. ♦ Union Territory Chandigarh’s Home department has declared the cricket stadium in Sector 16 a Temporary prison. 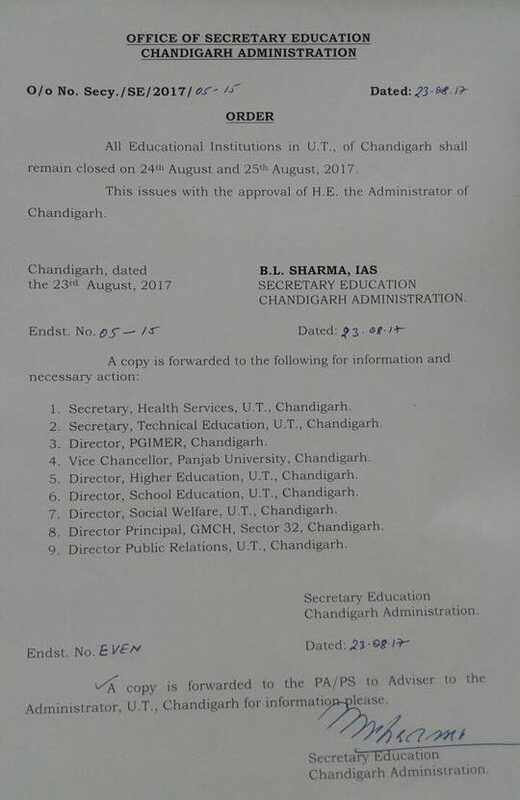 ♦ All educational institutions in UT Chandigarh have been ordered to remain closed on August 24 & 25. ♦ The Government Medical College and Hospital in Sector 32, Chandigarh, and Mohali health authorities have said that the department has put all the medical staff on alert and they are prepared to tackle any situation. ChandigarhX urges its readers to verify the facts before spreading it. Rumours and unverified information can be worsen the situation for the administration. Let’s be sensible.